Usually you will not need this as the program tracks where you have successfully submitted and will uncheck the sites for you when you load a project. 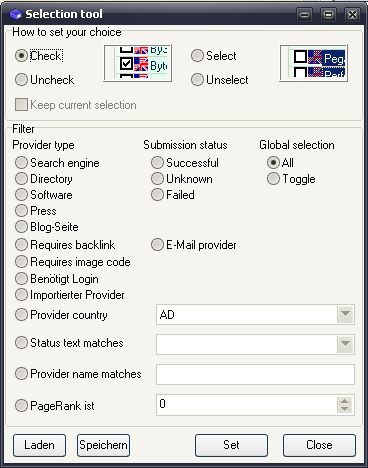 If you wish to submit to certain sites, use the Selection Tool. Click Main Menu → Tools or Tool bar (left of Provider List). If you load a new pad file, the selection if of course gone again, so you can load/save the selection for a later use.